As one of Europe’s leading clinical and research centres for corneal transplantation, Aarhus University (AU) and Aarhus University Hospital (AUH) is strongly committed to the project, which will explore exciting and innovative approaches to corneal regeneration. 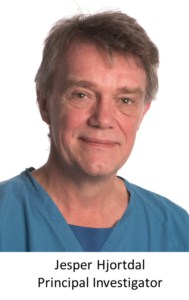 Through his already present leadership of the VISICORT multi‐centre clinical studies (WP2), Prof. Hjortdal have the opportunity to extend his on‐going research interest in the factors contributing to adverse outcomes from corneal transplantation and interest in corneal regeneration and will extend his collaborative network in this area. Furthermore, ocular research at AUH will be linked, through its involvement in this project, to new avenues of investigation in corneal regeneration and systems biology research. AU has one of the largest and most modern facilities for large animal research in northern Europe and Prof. Hjortdal has recently been involved in testing of corneal scaffolds in pigs and has the necessary permissions to perform experimental animal research. Prof Hjortdal received his medical degree from Aarhus University in 1987 and became a specialist in ophthalmology in 1997. He trained in corneal and refractive surgery at AUH and Moorfield’s Eye Hospital, London, UK. In 2001 he became consultant at the Department of Ophthalmology, AUH where he was appointed professor of ophthalmology in 2009. Prof Hjortdal has published more than 130 original peer‐reviewed papers mainly on corneal and refractive surgery related to corneal optics and biomechanical properties of the cornea. His doctoral thesis from 1997 was on biomechanical properties of the cornea in relation to refractive surgery. Prof Hjortdal is the main supervisor of several PhD students and is the Medical Director of The Danish Eye Bank, which is the oldest and the largest in the Nordic countries. Since 2010 he has been President for the Danish Ophthalmological Society and from 2013 President for the European Eye Bank Association.